This was not an option for us. 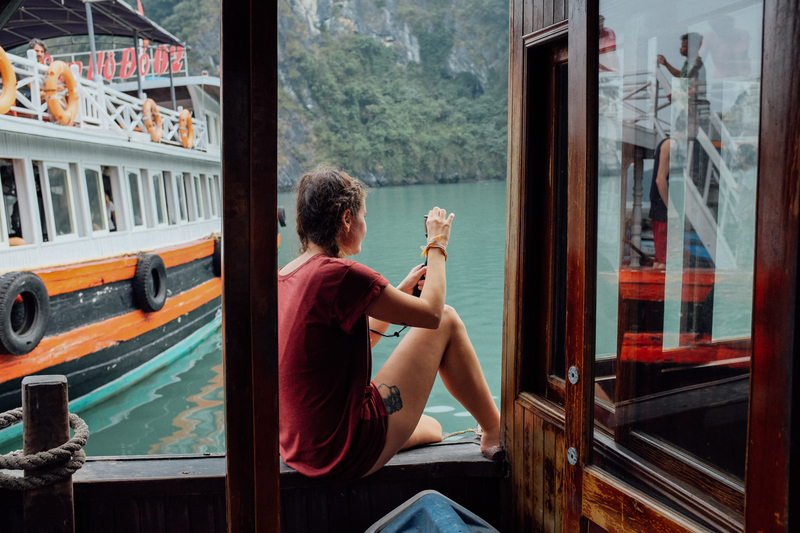 We were budget backpackers and we wanted to keep spendings to a minimum as we wanted to be on the road as long as possible. An iconic place like this could not be missed so we didn’t quite know what to do. 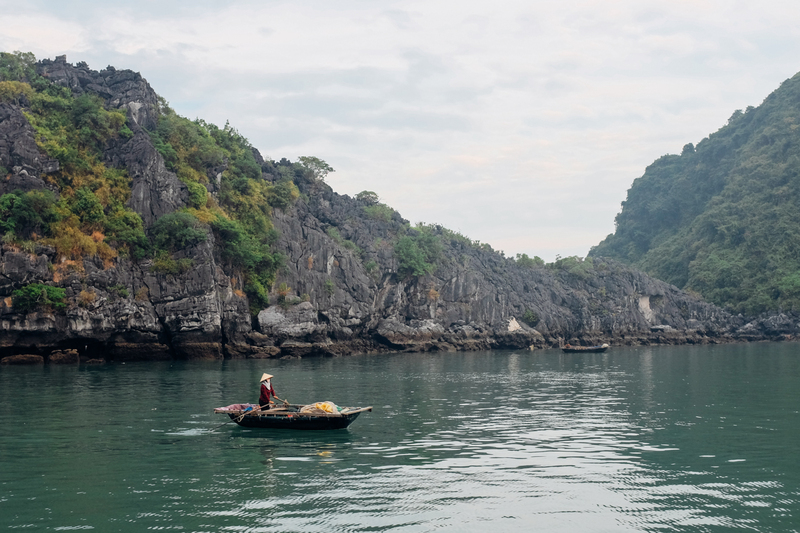 After talking to some people, they suggested us to take a bus/boat/bus and head off to Cat Ba which is the only livable island in whole Halong Bay. We searched up some guesthouses, went to our hostels’ reception and booked our transportation to Cat Ba. The next morning we were leaving behind Hanoi for a new adventure. Let me tell you. We were not disappointed. The island is absolutely lovely. Fishing boats on the horizon, smiling locals and great little restaurants welcomed us to our new home for the next couple of days. Now off to the good part. 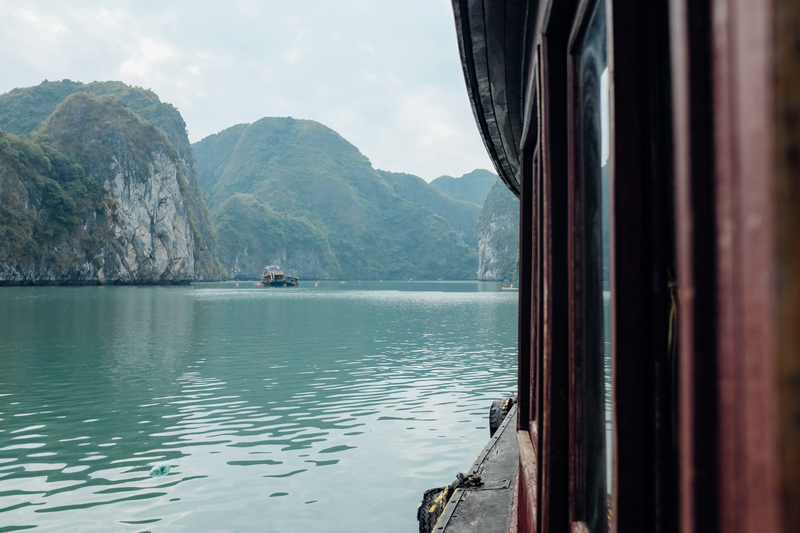 Halong Bay. Our tip : just go see the reception at your accommodation since most of them are affiliated to one tour. Our tour included: Lan Ha Bay, Halong Bay, kayaking, swimming, Monkey Island (which we would have skipped) and lunch. 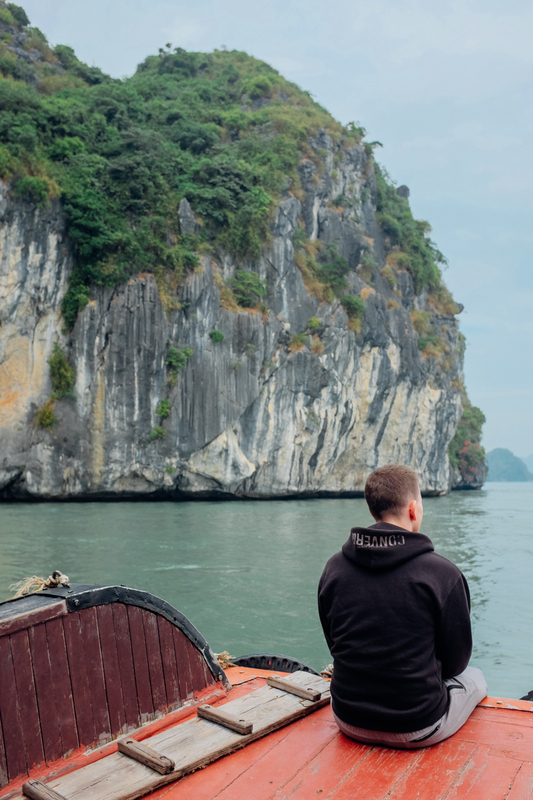 This whole tour cost us 15 USD instead of a couple of dollars if we would have left from Halong Bay. 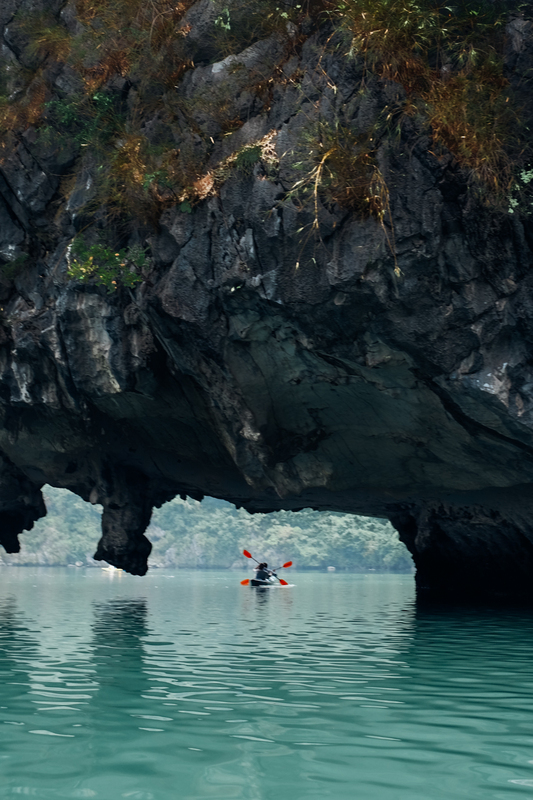 Some people might say it’s worth to do the multiple day tour in Halong Bay. 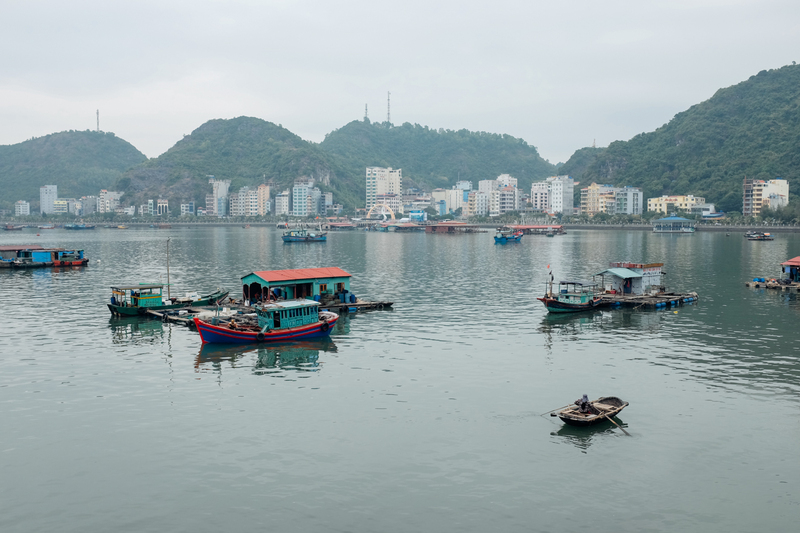 However, if you are on a budget, we highly suggest to go to Cat Ba. Let’s get back to our day. First things first, they came to get us at our guesthouse and brought us to the boat. The morning was pretty cool so we were smart to bring our sweaters. We bought ourselves a little coffee and sat at the front of the boat. This moment. The kind of moment when we will both be old and still remember. Cool morning, all wrapped up, the sound of the waves and a warm beverage keeping our insides warm. We felt like we were the only ones on earth. It was truly magical (Safe to say we were lucky we were a group of 8 on a boat that could hold 40 people). 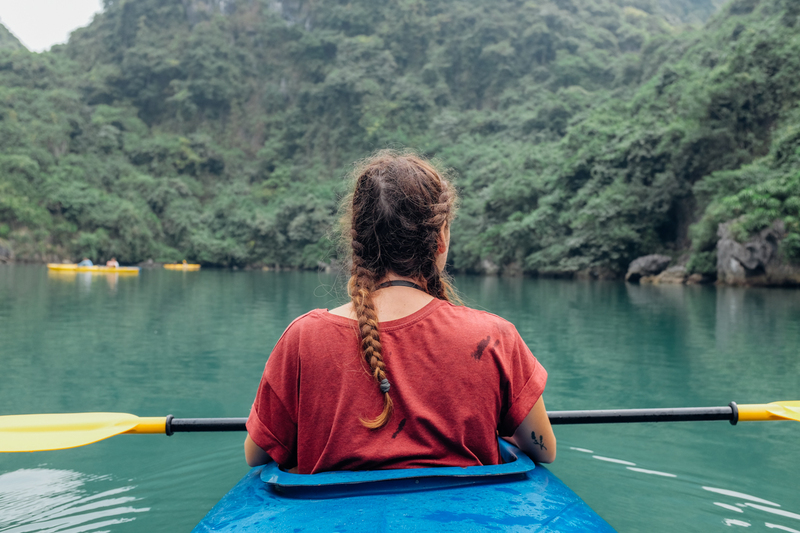 For our first stop, we went kayaking. It was really fun. Next, we had a bite to eat. Hands down the best meal we had in Vietnam. The cook was on board and made everything from scratch while we were relaxing and taking in the view. Then, it was digestion time and then comes the best part. Putting your swimsuit on and jumping off the boat and have some fun in the water. The last stop was Monkey Island. Rule number 1 bring closed shoes. Never hike in flip flops since it is a dangerous endeavor. I have 2 scars to prove it so be safe people. Now, as the name states, it is an island where they transported a bunch of monkey for tourists to see. We strongly advise to skip this if you could. It’s not very interesting but there is a nice viewpoint at the top that we didn’t get to see since I fell 10 meters before we got there. Oh well, scars are like natural tattoos right ? Even with the little downside of hurting myself, it was an amazing day. 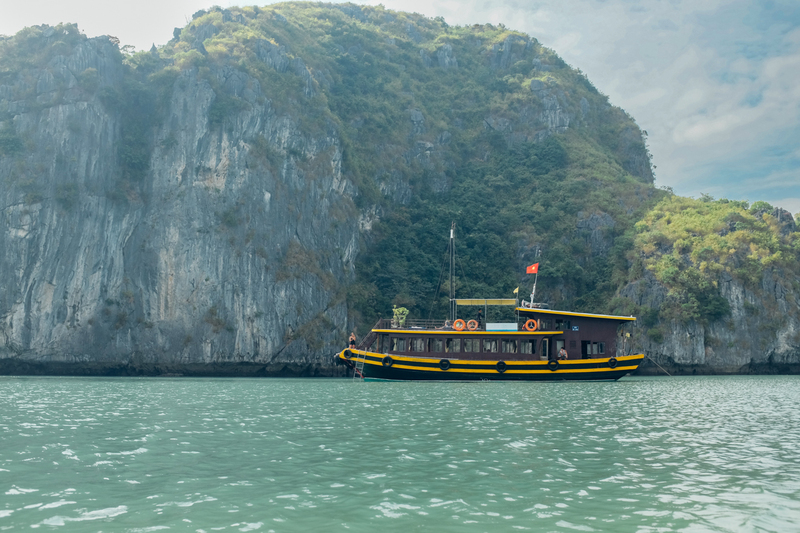 You need to see Halong Bay at least once in your life. It is a magical place and there is nowhere else where you can see anything like it!